Did you ever wonder why Rocky Balboa ate raw eggs when he was training? It wasn't to help with his digestion or increase enzymatic activity throughout his body; rather, all that protein was being used for muscle building. While muscle building does increase cytoplasm and all of the enzymes found therein, the biggest increase is seen in structural and motor proteins like actin and myosin. Valid concerns about bacteria in and on eggs have stopped bodybuilders from drinking raw eggs, but protein shakes and massive containers of whey protein have replaced them on the shelves of health-food stores, pharmacies, and supermarkets. In this chapter, we will examine some of the structural and motor proteins that Rocky was building, as well as more complex protein functions in humans, including biosignaling. Finally, we'll learn how to determine which proteins—and their concentrations—were in each of Rocky's eggs through separation and quantitative analysis. Typical functions provided by proteins within the cell include supporting cellular shape and organization, and acting as enzymes. The enzymatic function of proteins was detailed in Chapter 2 of MCAT Biochemistry Review and we are now ready to look at other protein functions. Structural and motor proteins are found in abundance within individual cells and are also found in the extracellular matrix. The cytoskeleton can be thought of as a three-dimensional web or scaffolding system for the cell. It is comprised of proteins that are anchored to the cell membrane by embedded protein complexes. In addition to intracellular support, extracellular matrices composed of proteins also support the tissues of the body. Tendons, ligaments, cartilage, and basement membranes are all proteinaceous. The primary structural proteins in the body are collagen, elastin, keratin, actin, and tubulin. Structural proteins generally have highly repetitive secondary structure and a supersecondary structure—a repetitive organization of secondary structural elements together sometimes referred to as a motif. This regularity gives many structural proteins a fibrous nature. Collagen has a characteristic trihelical fiber (three α-helices woven together to form a secondary helix) and makes up most of the extracellular matrix of connective tissue. It is found throughout the body and is important in providing strength and flexibility. The importance of the structure of collagen is highlighted in the disorder osteogenesis imperfecta, also referred to as brittle bone disease. Collagen—a major component of bone—forms a unique and specific secondary helical structure based on the abundance of the amino acid glycine. The replacement of glycine with other amino acids can cause improper folding of the collagen protein and cell death, leading to bone fragility. Elastin is another important component of the extracellular matrix of connective tissue. Its primary role is to stretch and then recoil like a spring, which restores the original shape of the tissue. Keratins are intermediate filament proteins found in epithelial cells. Keratins contribute to the mechanical integrity of the cell and also function as regulatory proteins. Keratin is the primary protein that makes up hair and nails. Actin is a protein that makes up microfilaments and the thin filaments in myofibrils. It is the most abundant protein in eukaryotic cells. Actin proteins have a positive side and a negative side; this polarity allows motor proteins to travel unidirectionally along an actin filament, like a one-way street. Tubulin is the protein that makes up microtubules. Microtubules are important in providing structure, chromosome separation in mitosis, and intracellular transport with kinesin and dynein, described in the next section. Like actin, tubulin has polarity: the negative end of a microtubule is usually located adjacent to the nucleus, whereas the positive end is usually in the periphery of a cell. Some structural proteins also have motor functions in the presence of motor proteins. The motile cilia and flagella of bacteria and sperm are prime examples, as is the contraction of the sarcomere in muscle. Motor proteins also display enzymatic activity, acting as ATPases that power the conformational change necessary for motor function. Motor proteins have transient interactions with either actin or microtubules. Myosin is the primary motor protein that interacts with actin. In addition to its role as the thick filament in a myofibril, myosin can be involved in cellular transport. Each myosin subunit has a single head and neck; movement at the neck is responsible for the power stroke of sarcomere contraction. Motor proteins are responsible for muscle contraction and cellular movement. Take a moment to review sarcomere structure in Chapter 11 of MCAT Biology Review as another example of the interaction between motor proteins and the cytoskeleton. Kinesins and dyneins are the motor proteins associated with microtubules. They have two heads, at least one of which remains attached to tubulin at all times. Kinesins play key roles in aligning chromosomes during metaphase and depolymerizing microtubules during anaphase of mitosis. Dyneins are involved in the sliding movement of cilia and flagella. Both proteins are important for vesicle transport in the cell, but have opposite polarities: kinesins bring vesicles toward the positive end of the microtubule, and dyneins bring vesicles toward the negative end. In neurons, we see a classic example of these motor proteins' polarities. Kinesins bring vesicles of neurotransmitter to the positive end of the axonal microtubules (toward the synaptic terminal). In contrast, dyneins bring vesicles of waste or recycled neurotransmitter back toward the negative end of the microtubule (toward the soma) through retrograde transport. The activity of kinesins is illustrated in Figure 3.1 below. Figure 3.1. Stepwise Activity of Kinesins Kinesins move along microtubules in a stepping motion such that one or both heads remain attached at all times. While proteins primarily exert enzymatic or structural functions within the cell, they also can have stabilizing functions in individual cells and the body. Proteins that act in this way transport or sequester molecules by binding to them. Binding proteins include hemoglobin, calcium-binding proteins, DNA-binding proteins (often transcription factors), and others. Each binding protein has an affinity curve for its molecule of interest; the oxyhemoglobin dissociation curve is one well-known example. This curve differs depending on the goal of the binding protein. When sequestration of a molecule is the goal, the binding protein usually has high affinity for its target across a large range of concentrations so it can keep it bound at nearly 100 percent. A transport protein, which must be able to bind or unbind its target to maintain steady-state concentrations, is likely to have varying affinity depending on the environmental conditions. Cell adhesion molecules (CAMs) are proteins found on the surface of most cells that aid in the binding of the cell to the extracellular matrix or other cells. While there are a number of different types of CAMs, they are all integral membrane proteins. Adhesion molecules can be classified into three major families: cadherins, integrins, and selectins. Cadherins are a group of glycoproteins that mediate calcium-dependent cell adhesion. Cadherins often hold similar cell types together, such as epithelial cells. Different cells usually have type-specific cadherins; for example, epithelial cells use E-cadherin while nerve cells use N-cadherin. Integrins are a group of proteins that all have two membrane-spanning chains called α and β. These chains are very important in binding to and communicating with the extracellular matrix. Integrins also play a very important role in cellular signaling and can greatly impact cellular function by promoting cell division, apoptosis, or other processes. For example, integrin αIIbβ3 allows platelets to stick to fibrinogen, a clotting factor, which causes activation of platelets to stabilize the clot. Other integrins are used for white blood cell migration, stabilization of epithelium on its basement membrane, and other processes. Selectins are unique because they bind to carbohydrate molecules that project from other cell surfaces. These bonds are the weakest formed by the CAMs discussed here. Selectins are expressed on white blood cells and the endothelial cells that line blood vessels. Like integrins, they play an important role in host defense, including inflammation and white blood cell migration, as shown in Figure 3.2. Figure 3.2. 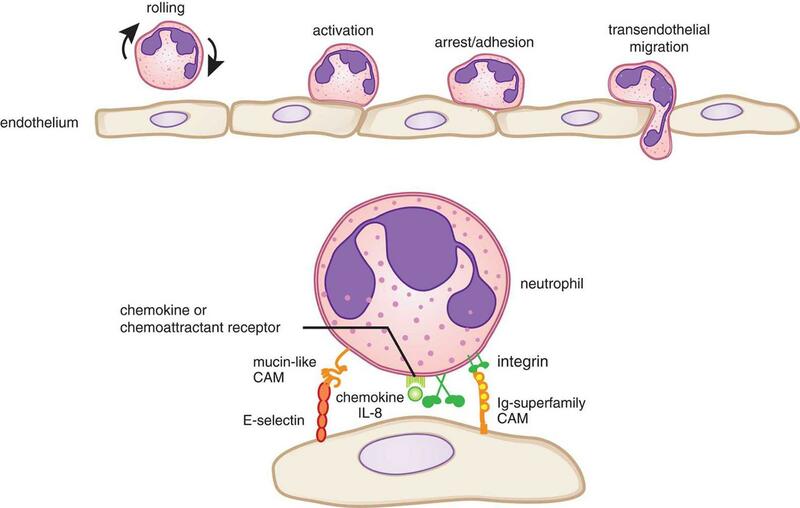 White Blood Cell Migration Using Selectins and Integrins Many other proteins are involved in white blood cell migration, but are outside the scope of the MCAT. Many medications target selectins and integrins. For example, research has shown that the ability of cancer cells to metastasize (break away from a tumor and invade other distant tissues) is associated with unique expression patterns of CAMs. By targeting these CAMs, metastasis may be avoided. To stop the clotting process during heart attacks, other medications target CAMs used by platelets. 1. How do cytoskeletal proteins differ from motor proteins? 2. True or False: Motor proteins are not enzymes. 3. What could permit a binding protein involved in sequestration to have a low affinity for its substrate and still have a high percentage of substrate bound? 4. What are the three main classes of cell adhesion molecules? What type of adhesion does each class form? 5. 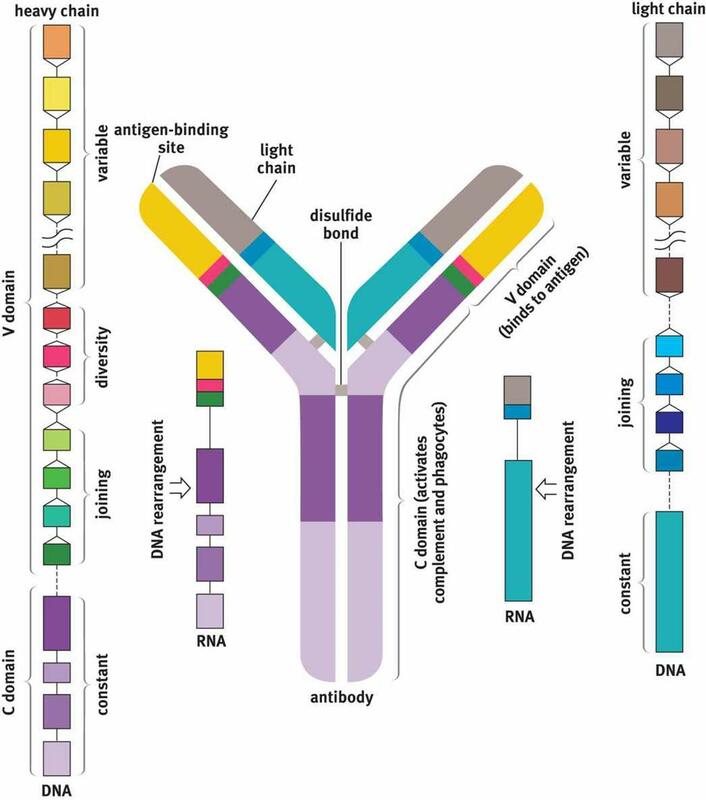 When an antibody binds to its antigen, what are the three possible outcomes of this interaction?